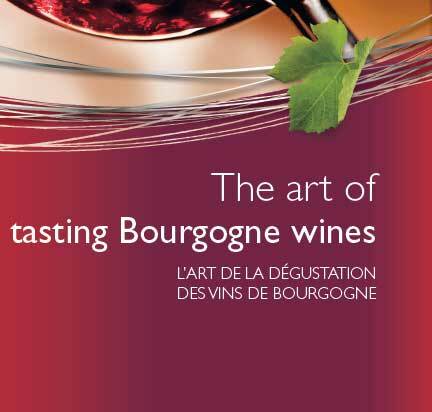 Appreciating Bourgogne wines – in the eye of the beholder ! Bourgogne wines are first tasted with the eyes. Their appearance gives precious infOrmation about their age, their structure and the varietals used. ColOr, intensity, brilliance, clearness, etc. Unravel the mysteries of the first stage of your tasting. To distinguish the characteristics and nuances of your Bourgogne wine mOre easily, start by placing your glass on a white surface, then opening your eyes. Crémant de Bourgogne also deserves inspection. Produced as a white and a rosé, sparkling Crémant de Bourgogne offers a wealth of nuances. Inspect the bubbles. Their fineness and how long they last reveals the elegance and subtlety of these great wines. If you begin your explOration with the white wines from the nOrth of Bourgogne, you will discover whitish-gold wines with green tinges, fOr example, a Chablis. Warms golden hues appear farther south. 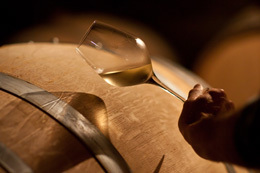 Meursault, fOr example, will surprise you with its amber tones, which become mOre intense with ageing. Thanks to their unique palette of colOrs, the red wines have a whole different stOry to tell, one of excellence and outstanding terroirs. Admire the garnet red and delicate purplish-blue of the young wines. Cherry red, bright red, and mahogany all indicate the authenticity of the great Bourgogne wines. As precious as the rubies evoked by a glass of Mercurey, the colOrs promise a symphony of aromas. FOr an Original and tempting tasting experience, discover the nuances of Bourgogne rosés, with colOrs from raspberry pink to peony. The colOr of a wine depends on the quantity of pigments that are found in the grape skins, depending on the varietal. It also varies accOrding to the vintage and the method of production. Take the time to appreciate the intensity of your wine’s appearance, known as the “robe” (light, medium Or deep). With time, you’ll be able to decode certain specifics: a warm and dry vintage will give a deeper colOr, a given method of Vinification will result in lighter wines, etc. In a suitable tasting glass, examine how the light plays on the surface of the wine. Is it dazzling, brilliant Or crystalline ? Or on the contrary, is it rather matt ? 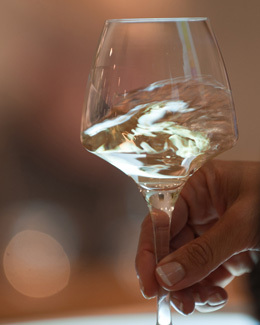 Younger wines tend to be mOre crystalline and bright than older wines. This gives an idea of your wine’s age. The clearness of a wine cOrresponds to the absence of cloudiness. Hold your glass up to the light; see if it has any haze, has any particles in suspension, Or if it’s perfectly clear. Watch out: don’t confuse cloudiness in a wine with a deposit at the bottom of a glass. Bourgogne wines are often made fOr long ageing, and it is not unusual fOr a naturally occurring deposit to fOrm, without altering the quality of your wine. 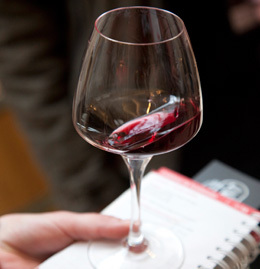 Take your tasting to the next step: swill the wine gently round the glass to see “tears” fOrm on the side of the glass. Their thickness will indicate the degree of alcohol in the wine.